Hi there Take Heart readers! My name is Heather from Blessed Little Nest and I'm excited to share our lovely story with you. Ours is one full of the plans we had for ourselves, and then the ones life handed us instead. 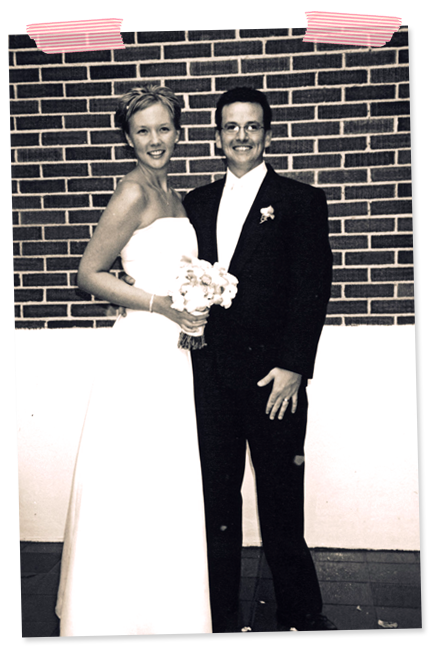 My husband Scott and I married 10 years ago (this April) when we were just 25 and 26 years old. We had dated for three years, even though we both knew from day one that we'd be together forever. We were married in a little mountain town a few hours from where we lived in Arizona. We had a planned to be married in a lovely outdoor ceremony, until we woke on our wedding day to find ominous clouds and a harsh snow storm. Did I mention we were in Arizona? In April? Well, with the help of our family and friends we quickly came up with plan B. We were married in a historic hotel, in front of a crackling fire, with friends and family surrounding us. The moment we said "I do" the snow stopped and the sun came shining through the windows upon us. I've held that moment in my heart as God's blessing on our marriage. I believe He was watching over us that day, and all the days that have followed. For the next few years life went right along our plans. We bought our first home and settled into creating our own nest. Almost exactly three years after we were married, we welcomed our first child, a son named Henry. Two years after Henry was born we were pregnant again and back to making more plans. And then we experienced a miscarriage. While that was definitely NOT part of our plan, we found we were able to rely on each other to stay strong and hopeful for the future. One year later we welcomed our second child, a son named Samuel. He arrived six weeks early and sent us on a journey we definitely did not plan on. After being home for just 3 days we found ourselves back in the hospital due to Samuel's weight loss and inconsistent test results. On the 8th day of our stay, Samuel's body went into shock and began shutting down. He was rushed to the Pediatric Intensive Care Unit where doctors determined he had a severe blood infection and would need exploratory surgery to find the cause. What they found was a stricture in his small intestine that was 2cm long, two thirds closed, and full of micro perforations that had allowed the bacteria Citrobacter to leak into his blood stream. Over the next few weeks we watched helplessly as our son fought for his life. Our family was pulled in different directions emotionally and physically. After weeks living in the hospital we learned that this rare blood infection had turned into a devastating form of bacterial meningitis and destroyed his perfect little brain. We found ourselves in the position to decide if his body should be kept alive on life support, or if he should be allowed to go meet Jesus peacefully. Together we chose to let him go Home, and took him to a pediatric hospice facility where he passed away when he was 6 weeks old. We had been married for only 6 years, and were only 32 and 33 years old when Samuel died. In the six weeks of his life, we had gone through things that most people go an entire lifetime without dealing with, and now we were left standing face to face with the greatest fear of our lives- the loss of a child. While we may not have had age or life experience on our side to help us navigate this new journey, we did have a loving God watching over us. Knowing the divorce rates of couples that have lost a child, our families feared that our marriage wouldn't be able to handle this kind of struggle, but He knew better. He carried us through every storm, reminding us to let each other grieve independently. He held our hands as we asked questions we were afraid to hear the answers to. He sat next to us while we made decisions that no parent should ever have to make. He loved us even though at times we felt anger and frustration at Him. He waited patiently for us to come to him, each in our own time. He stood next to as we worked to figure out how to function in a world without our son. And He always, always kept sunlight on our faces so we could keep it on each others. Because of the way He loved us, we learned how to love and care for each other, in a completely new way. A more patient, compassionate, and faithful way. God had used our struggle to create an unbreakable union and we felt stronger, braver, and freer because of it. On what would have been Samuel's first birthday we heard the doctor tell us we were pregnant again. As we watched our daughter wiggle around on the ultrasound screen, I thanked God for all the blessings He's provided our union with. Through our journey He's taught us how to stop planning, and instead embrace the things life throws at us. With Him by our side we know that together we can walk through anything life tries to hand us. I'm not surprised that this post touched my heart & had me crying! Heather is a beautiful writer, and a beautiful person. Thank you so much Heather for sharing your story with us! Just plain beautiful. Many blessings to you! I so love this love story series! And I really love this story of God's grace and mercy holding us through the trials and devastations we face in life. Thanks to Heather for sharing such a personal story. Thank you for sharing your beautiful story. One thing I have learned through life is that God is ALWAYS good, even when we experience hardships and heartache. My heart is so sad for your loss, but so joyful for your new little one. You already have a little saint in heaven who is praying for your family. That is a blessing in itself. God bless you! Heather, I don't think you've ever told the story of Samuel through the eyes of your marriage, and what a sweet and encouraging perspective it is. Thanks for sharing it with us on Valentine's Day weekend. A reminder that with God's grace and love, our marriages can withstand anything. I love Andrea's perspective. You have a great testimony that marriage can endure the worst of storms. And Heather, the word I kept thinking about when I read this and saw your photos is grace. You are full of grace. Thanks for this offering. thank you so much for sharing your story with us Heather. i am newly engaged and everytime we try to plan something regarding our wedding or even our future God sends us in another direction. it makes me frustrated at times but im glad im not the only one. danielle, i added your blog to my friendly friday post! Oh my goodness, thank you so much for sharing that with us, I have tears of joy this morning reading that. i love heather. i laid in bed a few nights ago reading her blog for like 2 hours. Heather, this is... well, words seem weak to describe it. It's like seeing Jesus face-to-face reading your story. Thank you doing the hard work and sticking with your convictions so that we can learn from you. You are amazing. I am going to share this with a friend of mine who lost her daughter to stillbirth. Her marriage is strained right now because of it. i love heather, and i love this story. such precious words, and proof that God can indeed create beauty from the mess. Heather I loved reading your story. And Danielle thanks for hosting such a wonderful series! I love Heather and I love her post here. So glad she could share her love story. how beautiful. thank you so much for sharing and being a testimony to marriage that goes against statistics and towards Christ. bless you guys! I just love Heather. Her story is amazing. This was just beautiful... what a gorgeous love story. Awesome story. What a great testimony! Look at you two! Cuties. this story gave me chills. i can't even imagine how hard this would be but so wonderful that they've overcome it the way they have. aww great story. wow! through God's grace they made it though! awesome.